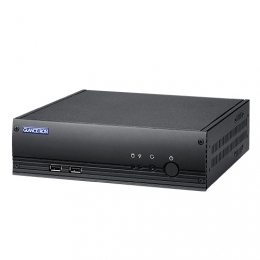 The Booksize 9550 from Glancetron is a fully-equipped compact computer with a noble design. Thanks to its compact size it only requires minimal work space yet, it is equipped with extraordinarily powerful hardware components. The system features an Intel Atom D525 processor and impresses with a 1.8 GHz CPU with a standard RAM of 1 GB and a hard drive capacity of 320 GB. The robust 6.4 cm 2.5 notebook hard drive is designed for mobile work areas, and thus even withstands placement in harsh production environments. Because of its high performance, the Glancetron 9550 is construed for a broad spectrum of applications, standard. In order to react flexibly to future requirements, expand the memory of the Booksize up to 4 GB DDR3. You therefore also may implement particularly computing-intensive applications over a small area. The integrated SATA hard drive offers plenty of space for systems and data, with its 320 GB. Since it is especially failsafe, the Glancetron 9550 is ideal for 24-hour operation or for usage in rough environments for example, in hospitality, discos, etc.. The Intel processors generate only a little heat, and therefore require less ventilation. The result is a lower annual energy cost, which also reduces operating costs. Reliable performance and the smallest measurements predestine it for a variety of applications. Even in the most cramped POS there is enough space for this compact PC. With the aid of an optional wall mounting bracket mount it either to the counter or the wall. Alternately, set it up vertically to save additional space, utilizing the included elegant stand. Because of its compact size you may also place it on the back of terminals or monitors, and turn a simple display device into a complete, high-performing system. There is also a corresponding VESA mount optionally available. Thanks to a large number of interfaces, the 9550 is ready for professional operation, and not just at the POS in addition to the standard ports for VGA, keyboard, mouse, printer, sound in/out, etc. there are five serial, four rear-placed USB and two Ethernet connections for a higher degree of flexibility. Two additional USB ports on the front simplify access during operation. The Gigabit Ethernet interface guarantees worry-free connection to existing infrastructures and networks. The 9550 is thus an ideal platform for applications at the checkout, POI, back office, infotainment, multi-media, laboratory or work stations with the highest demands on performance and limited available space.